As I mentioned earlier, Little Tomato and my cousin Eva are sharing a birthday party this year... and it is next weekend! I still have *loads* to do, but as of now, I can draw a nice big check mark next to the "garland" on my To Do list. Once husband gets home tonight, we can officially hang it up in our living room, but until then... I am eagerly anticipating it!! 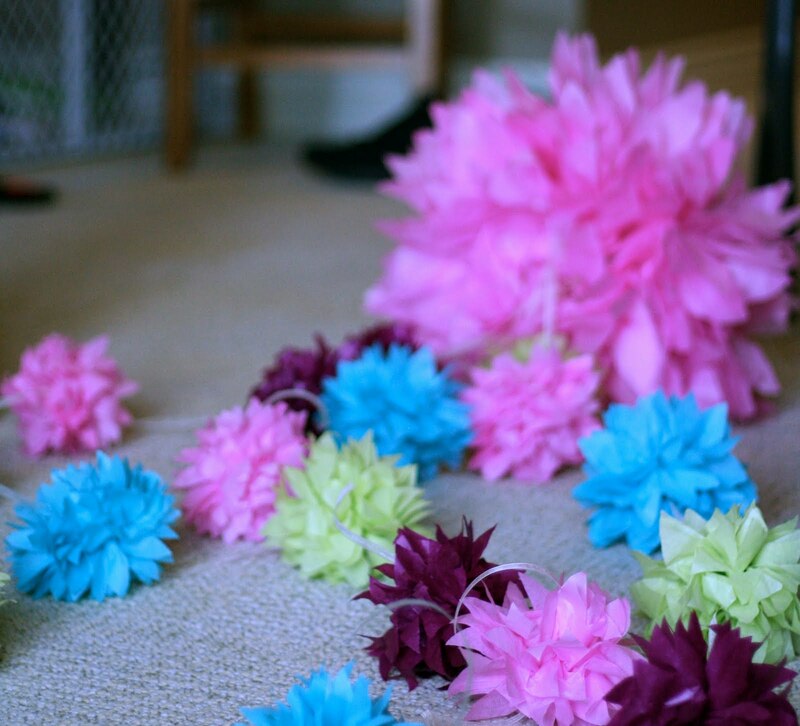 The garland is made of 6" diameter tissue paper puffs tied together with cream organza ribbon. Since we have a tall ceiling in our living room, the BIG puff is going to hang from our ceiling fan in the center of the room. There are four garlands coming off the center ball which are going to attach to the four corners of the living room to give a 'tented' feel in the room. I calculated that I needed 11 puffs per garland, which is a grand total of *45* puffs (counting the big one in the middle). As it is a spring party, I loved the idea of celebrating everything in bloom. I designed the invitations with a garland of flowers in the upper corner, and printed them on plantable paper so the invitations can be planted and grown into flowers of their own! Isn't it nice to check off a project from your CRAFTY list??! I love your colors!